As we get used to a sedentary lifestyle, some side-effects include less activity, wrong postures, and back pain. Back pain could interfere with your daily life. It can be difficult to bend, lie down, stand or even sit. There are many reasons why people suffer from back pain. From back conditions like scoliosis to poor posture, back pain can attack anyone. In most cases, the reason for a nagging back pain is the wrong posture when we sit on office/home chairs. There are many ergonomic chairs that you can buy to help you reduce the back pain. There is a new type of chair that has proven to be quite effective for back pains. Find out what is a gravity chair and why many are using gravity chair for back pain today. A gravity chair is a type of chair that is designed to provide ultimate relaxation as you sit without any force to hold you back. Only a piece of thick and durable fabric holds your weight. This material is attached to a metal or wooden frame using a special cord like the ones used in a bungee. 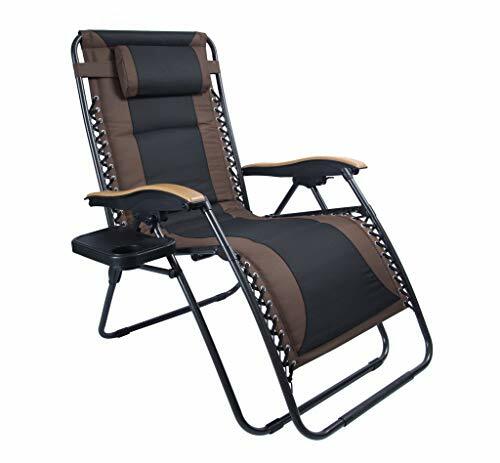 You can find a gravity chair that looks very similar to a lounge chair with support up to the legs or just a regular chair with supports that only extend up to the bottom. There are many designs of a gravity chair but the most typical has a generous back and seating area, with a very strong frame and large armrests. There are gravity chairs with some enhancements too. You can find seats with larger armrests to hold cups, plates, and umbrellas. Most of these chairs are used outdoors, near the pool or at the backyard. How does a Gravity Chair help in reducing back pain? Gravity chairs can help reduce back pain by supporting the neck, back, and hips. The seat is simply made from a tough but flexible material that is suspended by cords, therefore, there is no hard surface that comes in contact with your back. If you have back pain then you can rest your back and reduce pain. If you have back conditions like scoliosis, kyphosis or lordosis, you don’t need to conform to a seat with a hardback support. You simply sit or partially lie down and feel comfortable. Gravity chairs come in a variety of designs and materials. You may find a few that seems to look the same but be meticulous. Check the material foremost because this gives a hint as to how good a gravity chair is. In this article, I am reviewing the best gravity chairs that you can buy online. I have done an extensive research on each chair to make sure you get all the necessary information you need to make the right decision. In case you’re in a hurry, here are my top three recommendations for the best gravity chair. Still confused about which gravity chair is best for you? 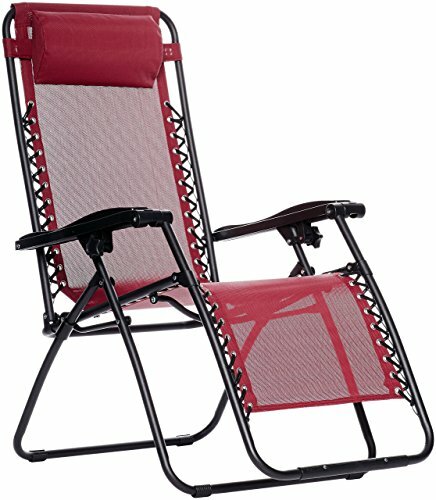 Let me help by providing detailed reviews on the best gravity chairs that I found in the market (and the ones you can buy online). These reviews will definitely help you gain awareness and understanding about the best features, pros, and cons of each gravity chair. Below is the table that shows all the ergonomic gravity chairs covered in this review. Now let’s have a look at the detailed reviews of each of the ergonomic gravity chair covered in this article. Give your aching back a rest with the Caravan Sports Infinity Zero Gravity Chair. This is a chair with a durable textaline fabric that is strong, very resilient to tear and wear. It is suspended using a double bungee system so you can guarantee that this won’t lose its form and shape even when used on a regular basis. The Caravan Sports Infinity Zero Gravity Chair will help you relax with its easy recline function. You can lock this in any position and has an adjustable headrest and lumbar support system. You can easily and safely lock it in place with a dual fingertip locking system. When you are done relaxing and you want to keep this chair away, you can fold this down to only 6.3 inches wide. This will support weights of up to 300 pounds. This is going to be a really good deal for you. This is a pair of adjustable zero gravity lounge chairs from Best Choice Products. These are recliners that will let you lie down, relax and even take a nap. These are designed for your ultimate comfort. You can use this to relax in your backyard, at the pool or in your patio. These can also be taken outdoors and to the beach, for camping or for RV use. This is also considered a patio or pool furniture but may also serve as comfortable seats in beauty salons or in spas. 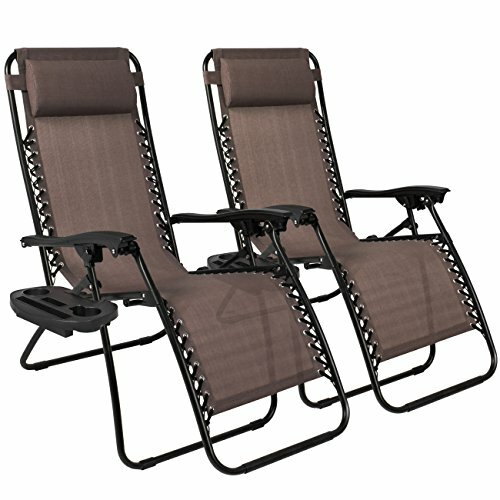 The Best Choice Products Gravity Chairs are made from UV-resistant mesh material with a weight capacity of 250 pounds. Because air can pass through the material, you can guarantee that this won’t make you perspire or can cause friction against your back. These even come with removable padded headrests that you can use as pillows and cradle your neck when you sleep. This gravity chair also comes with a cup holder tray where you can place drinks, your phone or tablet, a magazine or a newspaper. You can fold this away when not in use and it takes very little space as well. Sit relaxed, deal with your back pain and shield yourself from the harsh sun’s rays with the Bliss Hammocks Zero Gravity Chair. This type of chair is a stress-reliever because it will allow you to remain weightless. This is not found in most traditional gravity chairs and most offer this sunshade as an additional accessory that you need to pay for. This also comes with a drink tray which is another convenient feature that’s again not found in traditional gravity chairs. The seat of the Bliss Hammocks Zero Gravity Chair is made from woven PVC-coated polyester to improve versatility and strength. You can use this chair on a regular basis and still it will retain its fine form and will still keep your back healthy and pain-free. The frame is powder coated, is strong and will never rust. These features make this gravity chair for back pain a good investment and give good value for your money. You can fold this recliner away when not in use. This will instantly fold and is easily stored away when you are not going to use it. And because it’s light, you can transport this easily anywhere. It has a 360- lbs. capacity. 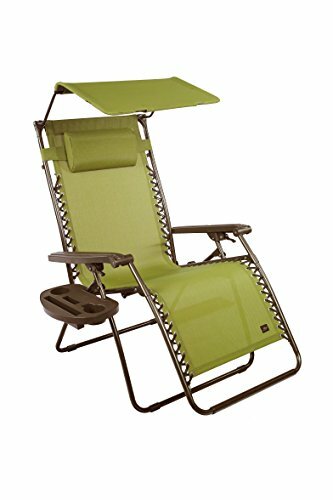 You are off to the beach with the STRONGBACK Low Gravity Beach Chair with Lumbar Support. This low gravity chair has an award-winning and patented lumbar supportive design that aligns your body posture and reduces tension. This chair helps support your back and reduces pain by relaxing your muscles. This ergonomic seat is made to align your hips and back for maximum comfort and ultimate relaxation. 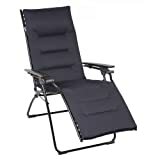 You can use this portable low gravity chair when you travel, for camping, picnics, beach trips, concert events, sporting events, and other activities outdoors. This chair can be easily folded and transported to anywhere you need to be. This has a backpack style carrying case with double straps so you can easily take it anywhere without breaking your back. 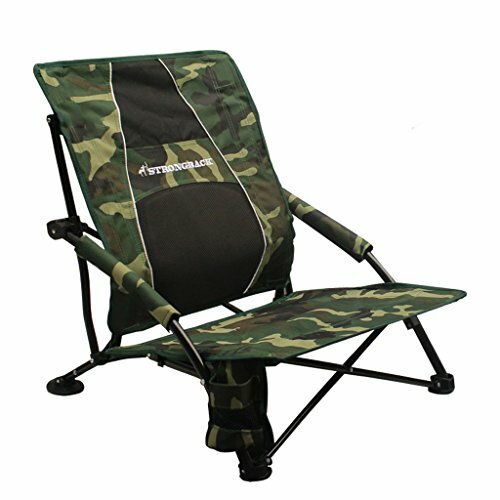 The STRONGBACK Low Gravity Beach Chair is durable and has a 300 lbs. weight capacity. What makes the PHI VILLA Padded Zero Gravity Lounge Chair better is its unique effective lock design. This has a lock catch that you will find convenient to operate compared to twist knobs. Just pull the clip back to secure the chair and push the clip front to unlock when you are done. The padded seat and back are suspended by a double bungee system that will make this seat more comfortable. There is a cup tray included in this purchase so you can place your food, drinks and other small items. 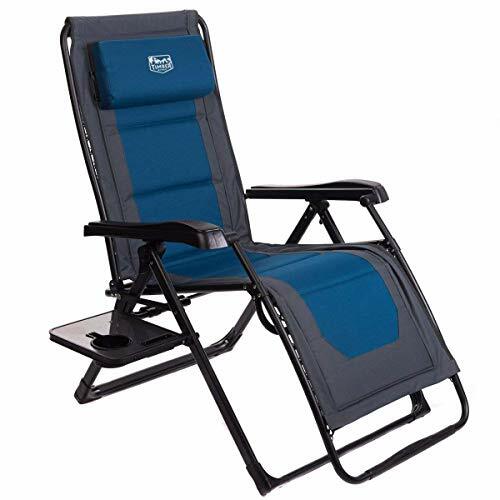 The PHI VILLA gravity chair is padded so you can feel more comfortable as you “hang in there.” You can adjust this chair into a reclining position with a lockable reclining system. You can adjust this to any position and according to your preference. There is no assembly required to use this for the first time. It is foldable so you can take this anywhere you want to relax. You can use the PHI VILLA gravity chair almost anywhere indoors or out. Use it as your permanent TV chair. Use this to relax outdoors beside the pool, at the beach, in your garden and when you go camping in your RV. 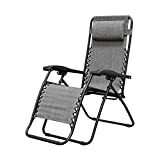 This zero gravity chair from AmazonBasics could match your outdoor patio décor. This chair offers a stress-free way to relax and to keep your back, neck, and shoulders supported as you sit and relax. This chair has a breathable mesh material called Textilene that will let perspiration evaporate. It will also enhance the feeling of being suspended in zero gravity. 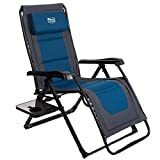 The AmazonBasics zero gravity chair has a powder-coated steel frame to improve strength and lightweight portability. The double bungee support system will connect the fabric to the frame. 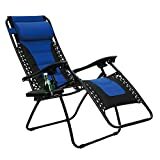 This zero gravity chair is also very durable despite its design. It can carry up to 300 pounds of weight. It has a padded headrest and contoured armrests so you can sit back and just forget all the stress and pains. This patio lounge zero gravity chair will look awesome in your backyard or poolside. The Timber Ridge Zero Gravity Chair is slightly oversized so you can be comfortable as you sit, relax and even sleep. This chair offers maximum loading capacity as it can support up to 350 pounds of weight. It is sturdier than other chairs with its aluminum tube body and durable full-padded material that will cradle your body. It has an adjustable reclining position; it’s curved with an ergonomic design to give you that zero gravity experience. This is very comfortable because it is fully reclining. You can adjust it to any position which makes you comfortable. It comes with a fully padded seating, removable padded pillow for the headrest and lumbar support. This is a deluxe oversized padded zero gravity chair that will surely make you relax. This is fully added therefore you will feel comfortable from head to toe. It has a maximum capacity of 350 pounds and you can take this anywhere you need to relax and ease your pains away. It is made from steel tubes with a polyester fabric padded seat. The height of this chair may be adjusted and it can be folded away when not in use. 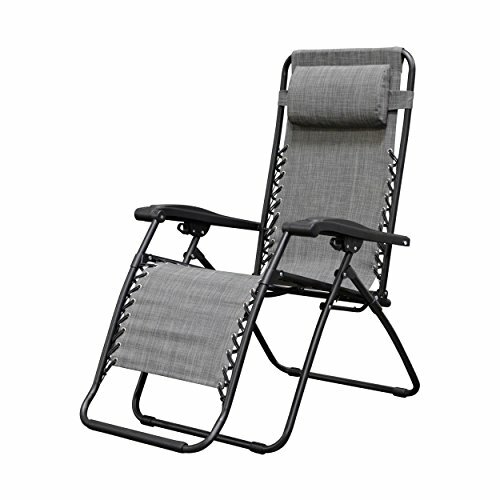 This zero gravity chair has a black steel frame with the padded material. You can take this to anywhere you want to relax like the park, the beach and even to a game. This anti-gravity chair is ergonomically designed with HLE steel tubing to give you a strong and comfortable support. You can relax and just take your mind off your worries with this zero gravity chair. You will feel as if you are floating on air with the Caravan Sports Infinity Oversized Zero Gravity Chair. This is made from UV-resistant materials so you can use this outdoors without any worry that these will be affected by natural forces. This seat has a weight capacity of 250 pounds. You will love all the extras you will get when you purchase this gravity chair. You get a removable/ adjustable padded headrest to improve comfort, extra cup holder trays which are slotted trays where you can place your drinks, magazines, your phone or tablet, and other small items. You can use this chair to relax in your backyard or take this to the beach. These won’t lose shape or change in shape especially the frame and the seating material no matter how much you use this every day. Consider the following when you are in the market for a good gravity chair for back pain. Remember that there are different gravity chair designs. If you can compare chairs then good; check for the type of material, the overall design, additional features and foldable capabilities of this type of chair. What is the type of material used to make the chair seat? The kind of material used does make the actual seat surface is crucial since this basically holds your weight. The most common material is a durable textaline fabric, a very strong yet breathable and washable fabric. The material should be properly stitched, double or triple stitched and with adequate holes or openings where the cord is set in place. And if you plan to just leave this chair outdoors, make sure that the seat can withstand the elements as well. What is the kind of material used to make the chair frame? Most of the time, the chair frame is made from metal but there are instances that you can find frames made from very hard plastic and even wood. Metal frames are mostly preferred because this material is lighter and hence easy to assemble and disassemble. There are many special features in most updated gravity chairs for back pain. Some models have a higher back with a built-in pillow at the edge of the back support. There are models with foldaway sunshade and canopy while some have water bottle holders, cup holders, dinner trays, etc. Can you fold/disassemble the chair? Most gravity chairs are foldable and hence may be stacked away when not in use. It’s rare to find a non-foldable gravity chair and mostly these are kept permanently outdoors. Don’t forget to check out gravity chair reviews. Check for customer’s opinions about a certain brand and any pros and cons in using the chair. Find any complaints and check out how the company was able to resolve these as well. Gravity chairs are indeed good for back pain. But make sure to shop smart to find the best chair that will work for your needs. Based on our research, Caravan Infinity Gravity chair is a great option to have for your home or even in office. These gravity chairs are not a replacement for your office chair though. You can’t work on your laptop/desktop when using this chair.